Boston, MA — Environmental scientists at Harvard have discovered that the Arctic accumulation of mercury, a toxic element, is caused by both atmospheric forces and the flow of circumpolar rivers that carry the element north into the Arctic Ocean. While the atmospheric source was previously recognized, it now appears that twice as much mercury actually comes from the rivers. The revelation implies that concentrations of the toxin may further increase as climate change continues to modify the region’s hydrological cycle and release mercury from warming Arctic soils. The results of the study, which was led jointly by Harvard School of Engineering and Applied Sciences (SEAS) and Harvard School of Public Health (HSPH), have been published in the journal Nature Geoscience on May 20. Mercury is a naturally occurring element that has been enriched in the environment by human activities such as coal combustion and mining. When converted to methylmercury by microbial processes in the ocean, it can accumulate in fish and wildlife at concentrations up to a million times higher than the levels found in the environment. Mercury is considered a persistent bioaccumulative toxin because it remains in the environment without breaking down; as it travels up the food chain, from plankton to fish, to marine mammals and humans, it becomes more concentrated and more dangerous. Sunderland supervised the study with Daniel Jacob, Vasco McCoy Family Professor of Atmospheric Chemistry and Environmental Engineering at SEAS, where Sunderland is also an affiliate. Mercury enters the Earth’s atmosphere through emissions from coal combustion, waste incineration, and mining. Once airborne, it can drift in the atmosphere for up to a year, until chemical processes make it soluble and it falls back to the ground in rain or snow. 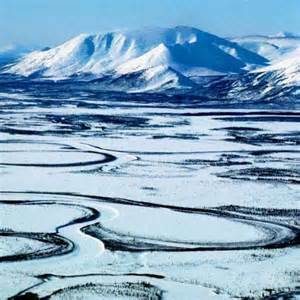 This deposition is spread worldwide, and much of the mercury deposited to Arctic snow and ice is re-emitted to the atmosphere, which limits the impact on the Arctic Ocean. January 26, 2016 — Harvard Chan School’s Philippe Grandjean, an expert in how environmental pollution impairs brain development, says that Flint, Michigan’s water crisis could have been prevented, given the United States’ long experience with lead contamination—and how to prevent it. Flint, Michigan temporarily switched its water supply from Lake Huron to the Flint River in April 2014 to cut costs. Should officials have known that lead contamination would result? Yes. We are dealing an ancient problem. Lead, a malleable and inexpensive metal, has been used for water pipes since the Roman period. It’s been known since then that toxic amounts of lead from these pipes could be released into soft water. This can occur because lead can be dissolved by weak acids found in many water supplies. The solution was well known, either the lead pipes had to be removed or water quality had to be changed. Replacing the pipes can be very costly, especially if their locations are no longer known, so adding lime and other corrosion inhibitors to community water has often been used as a remedy. Even with these known problems, it was only a few decades ago that plumbing codes were changed to require water pipes be made of materials other than lead. So today, a substantial number of service lines, distribution lines, and household water pipes in American communities are made of lead. Flint is by far not the first community where lead poisoning has emerged as a “new” problem. Fifteen years ago, Washington, D.C. changed the disinfection chemical for the municipal water supply from chlorine to chloramine, which caused lead to leach from the water pipes, and the problem was not corrected until three years later. More recently, similar problems have occurred both in North Carolina and in Maine. In all of these cases, the problems could have been foreseen, but decisions on water treatment were primarily made based on considerations of cost and feasibility. Last week it was reported that tap water in Sebring, Ohio had elevated levels of lead. It’s just another example that ancient water pipes made from lead will continue to cause problems. 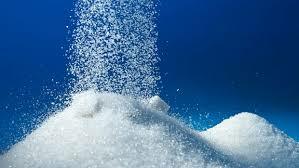 In the 1960’s, before conflict of interest disclosure was required, the sugar industry sponsored research promoting dietary fat as an important cause of coronary heart disease, and downplaying the role of sugar, according to a special report in JAMA Internal Medicine. A 1967 literature review in The New England Journal of Medicine pointed to fat and cholesterol as the dietary culprits of heart disease, glossing over evidence from the 1950s that sugar was also linked to heart disease. According to the new report, the NEJM review was sponsored by the Sugar Research Foundation (SRF), which is today the Sugar Association, although its role was not disclosed at the time. In the report, Laura A. Schmidt of the University of California, San Francisco and colleagues point out that Harvard professor of nutrition Dr. Mark Hegsted co-directed the SRF’s first heart disease research project from 1965 to 1966. 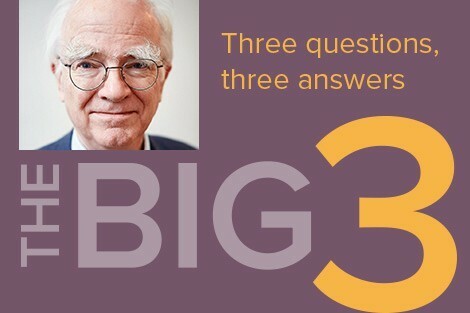 Schmidt and colleagues say communications between the SRF, Hegsted and another professor, Roger Adams, uncovered from the University of Illinois archives and the Harvard Medical Library reveal that the foundation set the objective for the literature review, funded it and reviewed drafts of the manuscript. The researchers also reviewed symposium proceedings and historical reports. In 1954, they say, foundation president Henry Haas gave a speech highlighting the potential of reducing American fat intake and recapturing those calories as carbohydrates that would increase the per capita consumption of sugar more than a third. Increasingly, epidemiological reports suggested that blood sugar, rather than blood cholesterol or high blood pressure, was a better predictor of plaque buildup in the arteries. Two days after The New York Herald Tribune ran a full page story on the link to sugar in July 1965, the SRF approved “Project 226,” a literature review on cholesterol metabolism to be led by Hegsted and, among others, Fredrick Stare, another Harvard nutritionist with industry financial ties. Wall Street Journal reporter Jacob Bunge painted the news in a different light. Bunge implied that behind the Bayer-Monsanto buyout, a similar proposed merger between Dow and Dupont, and the recently approved ChemChina-Syngenta deal, runs the story of an industry in trouble. “The price we are paying for biotech seed now, we’re not able to capture the returns,” said Ohio farmer Joe Logan. This spring, Mr. Logan loaded up his planter with soybean seeds costing $85 a bag, nearly five times what he paid two decades ago. Next spring, he says, he plans to sow many of his corn and soybean fields with non-biotech seeds to save money. With farmers giving up on biotech seeds, a global public wise to the destruction wrought by poisons like glyphosate (Monsanto) and neonicotinoids (Bayer), and a food industry increasingly under pressure to remove GMO ingredients, the Gene Giants figure all they need to do is get bigger—and more powerful—and they’ll be able to use their clout to step up the bullying of farmers, governments, scientists and the media. Outraged consumer and environmental advocacy groups are already calling for regulatory agencies to block the Bayer-Monsanto match-up. Agency officials will no doubt go through the motions, solemnly promising a “thorough review” before they do what they almost always do—hand multinational corporations a blank check. As soon as the media frenzy dies down and officials think the coast is clear, the Bayer-Monsanto “marriage made in hell” will likely be blessed by the powers that be. Two of the world’s most foul corporate criminals will be one. Monsanto will pack up its headquarters and head overseas. The much-maligned Monsanto name will be retired. But a corporate criminal by any other name—or size—is still a corporate criminal. This merger only heightens the urgency, and strengthens our resolve, to hunt down the corporations that are poisoning everything in sight. We will follow them to the ends of the earth, if need be. We will expose their crimes. We will end the toxic tyranny. We will become the Billions Against Bayer. And we will need your help. Dr. Pamela Costello Lecturing at Radiant Woman Healing Conference. We are proud to announce that Dr. Pamela Costello, MD, PhD will present two workshops at Radiant Woman Healing Conference October 27 to 30. 2016 at Embassy Suit…es & Spa, Albuquerque. One on Friday and another on Saturday. Here is a link to her website for some more information about this Holistic Neurological Physician and Surgeon. 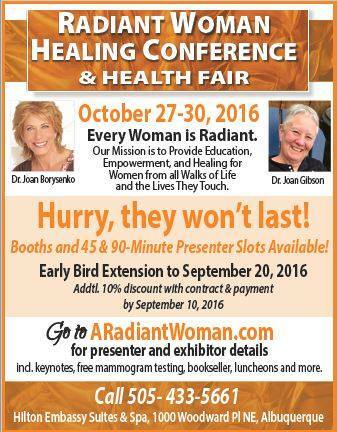 We are proud to announce that Dr. Pamela Costello, MD, PhD will present two workshops at Radiant Woman Healing Conference October 27 to 30. 2016 at Embassy Suites & Spa, Albuquerque. One on Friday and another on Saturday. Here is a link to her website for some more information about this Holistic Neurological Physician and Surgeon. Pamela Costello, MD PHD Receives 2016 Best Businesses of Albuquerque Award, second year in a row. 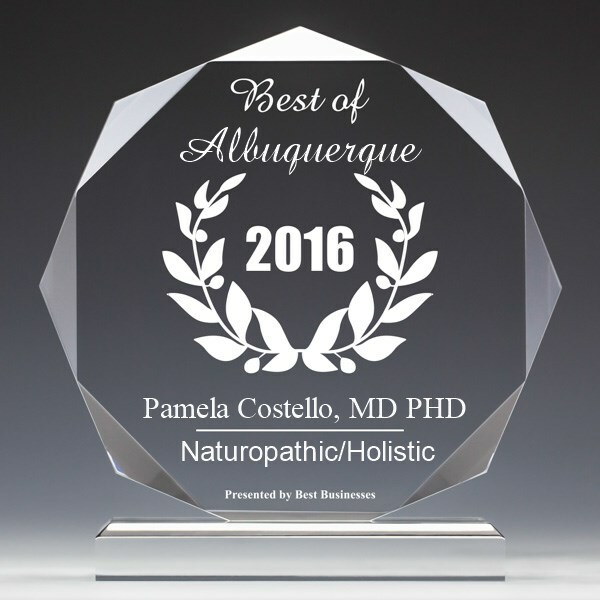 Albuquerque, August 17, 2016 — Pamela Costello, MD PHD has been selected for the 2016 Best Businesses of Albuquerque Award in the Naturopathic/Holistic category by the Best Businesses of Albuquerque Award Program.